Jasper is nothing if not a creature of habit. Rain or shine, he stops by My Coffee Story for breakfast every Sunday morning. 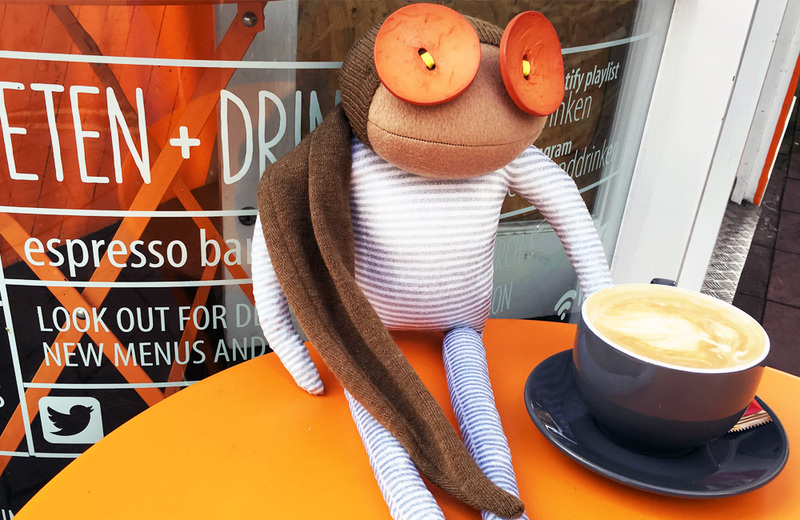 He really likes to take advantage of the fact that the best coffee in Brighton (in his opinion, of course) is right next to his home. All the baristas know him and his order by heart – they don’t even bother asking. So, minutes after he walks in, a big caffee latte magically appears in front of him. But, mind you, it’s not a regular caffee latte; it’s a very special order: lots of milk and just a little bit of coffee. He is just not a fan of the effect caffeine has on him first thing in the morning. His favorite seat in the house is the swings by the window – the perfect spot for people watching on a Sunday morning. Jasper got one of the swing seats at My Coffee Story. Pelicano is one of Kevin's favorite hang-out spots. Kevin likes the North Laine, because it is always so busy and full of life. So it’s not wonder his favorite coffee shop is a little gem tucked away there. Pelicano is a pretty well-known café in Brighton. It is rather small and is always busting with too many people, so getting a seat can be a bit of a challenge, but Kevin thinks it is totally worth it. They not only brew their own coffee, but it is so good that they actually supply it to several other establishments. And you can also buy a bag and take some home! Kevin doesn’t bother, though. He likes coming in, especially when he can get a table at one of the loveliest backyards in the North Laine. Besides, it is not only about the coffee for him – he is a fan of the generous slices of delicious cake! Pelicano is definitely his favorite place to hang out. Ingrid has recently moved and she is still exploring her new neighborhood. However, she can already say that Morris & Jacques is an early favorite! She discovered it the day after she got her keys. She was really tired from a day of moving, so she needed a little pick me up. And boy, did they deliver! She is a big fan of the mocha cappuccino and the all-day breakfast. The selection of homemade cakes is mouth-watering. She has an eye on a chocolate-orange cheesecake she saw last time she visited. That’s the next thing she wants to try. She also can’t wait to sit on their garden in the summer… possibly with a mocha cappuccino and a chocolate-orange cheesecake. Finding your new favorite Coffee Shop after moving can feel like magic. Howard knows that every Friday, Flour Pot Bakery makes an assortment of fresh doughnuts. As far as he is concerned, that’s the absolute best donuts in town. He waits the entire week for them, and he thinks they are definitely worth the wait! Now, don’t get him wrong. The coffee is great and the bread is delicious – it is a bakery after all! And he thinks it’s a great spot for lunch. But those donuts are just unforgettable. The Flour Pot Bakery also gets brownie-points with Howard because they are pet-friendly. Malcolm found Eten + Drinken by accident. He was just walking by and the drawings in the window just caught his eyes. Then, when he walked in, he noticed that the décor matched his eyes! How lovely! He is a big fan of the fresh sandwiches and fabulous coffee, not to mention the awesome people who work there. Oh, and don’t forget the amazing Dutch treats. He has never tasted a better Dutch Apple Pie. To make a quick stop there even more tempting, they actually offer a 20p discount on all coffee if you bring your own cup, which Malcolm always makes sure he does. That way, he gets a great deal and he is doing his part to preserve the nature. It’s a win-win on Malcolm’s book. Eten + Drinken colours match Malcolm's eyes... How could he not fall in love?